Let me start by saying that the products featured in this post were provided to me free of charge courtesy of Safe Catch Foods. This post may contain affiliate links, but this in no way influences the review to follow. As ones pallet matures and gets more refined minor variations in taste become more obvious. I mention this because there are a couple foods that no matter what, the more you pay the better the product. These type of items are peanut butter, honey, pancake syrup and tuna. There have been moments in the past (shhh don’t tell Jason) that I have tried to pull the wool over his eyes and bought the lesser versions. Nine times out of ten his refined pallet knows the difference and I am unable to fool him otherwise. Where this becomes obvious in tuna and tuna quality. Let’s talk for a moment about tuna, quality and mercury. Tuna is notorious for having mercury and because of this tuna is generally not safe for pregnant women – until now! 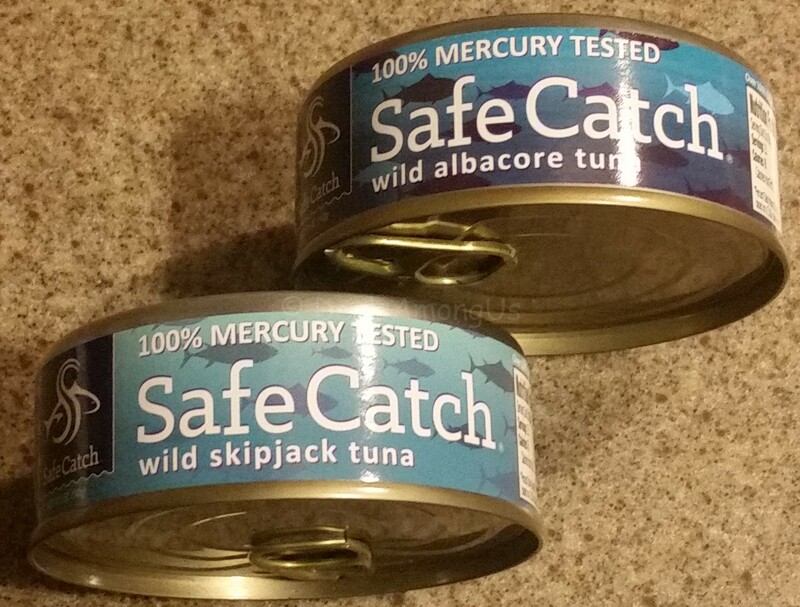 I recently tried a new brand of Wild Albacore tuna and Wild Skipjack Tuna (no longer available on their website) by a company called Safe Catch by Safe Foods. What is special about Safe Catch tuna? This is the only tuna that is 100% Mercury tested – yes I just said 100% tested, which means every single tuna is tested and if it measures above their stringent standards then it is included. All of the tuna caught by Safe Catch is not only dolphin safe as well as being pole and troll line caught. Safe Catch tuna contains no additives, is Non-GMO, and is BPA Free (BPA is an industrial chemical that is used to coat the inside of metal tins amoungst other things). All Safe Catch products are sustainability caught which means that the long-term vitality of the harvested species as well as the well being of oceans is taken into consideration.. When you open a can of Safe Catch tuna the first thing that greets you is the lack of fluid. Safe Catch does not add water to their products, only relying on the natural juices from the fish. The best way to describe the can contents is to imagine a tuna steak. The reason for this is that Safe Catch packs raw hand-cut fish into the can, then using a proprietary process cooks the tuna. The result is a high quality tuna that tastes closer to a tuna steak then shredded tuna. The retail on this can is around $3-4 dollars a can, which in comparison to the average on sale can is a little more money with much more taste – worth the extra cost and I do not have to fool Jason anymore. GIVEAWAY: Safe Catch Foods is giving one tuna prize pack to 1 person! (1) lucky winner will be selected at random to win a Safe Catch Prize Pack which will include 3 cans of Safe Catch Wild Elite Tuna and 2 cans of Safe Catch Wild Albacore Tuna – a $20.00 value! I will be randomly choosing 1 person on November 25 (11/25/2015) to receive this tuna pack! Open to residents in the US. To enter complete the entries below! Winner’s will be notified by me by email and prize will be fulfilled by Safe Catch Foods/Asylum PR. Remember you have 48 hours to claim prize, or I will choose another winner. GOOD LUCK!!! Win a Tuna Sample Pack! This entry was posted in Food and Drink Products, Giveaways, Gluten-Free, Reviews and tagged dinner, giveaway, lunch, non-gmo, product review on October 26, 2015 by Jennifer. My cat eats it. And my husband makes tuna salad with mayo, pickles and onions on toasted bread. He also puts a couple drops of lemon juice in it. I love a tuna salad sandwich on whole wheat toast with a slice of Swiss. I love tuna salad sandwiches. What is your favorite way to have tuna? I like to mix cooked quinoa into my tuna fish sandwich recipe (mayo, relish, diced onions) for extra protein, minerals, and vitamins. It’s my favorite sandwich to take hiking or camping. I like to serve my quinoa tuna fish sandwiches with grapes or an apple. My favorite way to have tuna is with my homemade mayo on some fresh lettuce. I like tuna with pasta peas mushrooms and ranch dressing. I like to make Tuna salad with mayo, relish and chopped celery. I enjoy having tuna in a pita bread with tomato, lettuce & Olives. I love tuna fish sandwiches. My favorite way to have Tuna is on a big salad. My favorite way to have tuna is in a sandwich with mayo and diced sweet pickles. I love that it’s non-gmo and bpa free! From what I’ve read, it seems that I would buy this for my family! I would love to try it. My favorite way to eat tuna is a noodle casserole! Mixed with mayo and pickles on a toasted english muffin! My favorite way to eat tuna is to make a tuna-salad sandwich on homemade Oat Bran Bread! My favorite way to have tuna is to make tuna salad on a croissant. I love tuna salad stuffed in green peppers. I enjoy mixing tuna into my salad of mixed greens and vegetables. I love making tuna salads. My favorite way to have tuna is to mix it into macaroni salad. My family loves a classic tuna salad. My favorite is in Tuna Macaroni salad. My favorite way to have tuna is in my homemade tuna casserole. I love tuna patties, with mac n cheese and corn!! I love tuna salad sandwiches with mayo, pickles and onion.